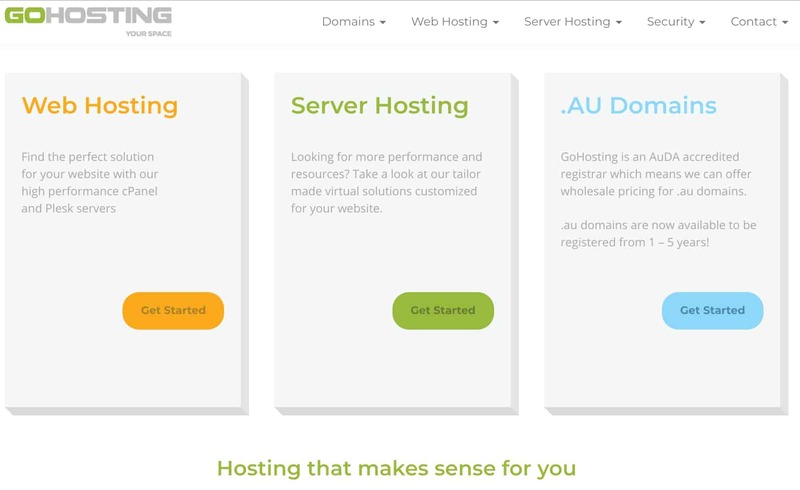 GoHosting Review 2019: Is GoHosting a Good Hosting? ASIO T4 Standard data centers, products supported by premium service partnerships, and years of experience make GoHosting is a rock-solid hosting option for individuals and small-to-medium businesses in Australia. GoHosting’s founders could both boast 15 years of experience when they founded the Canberra-based company in 2003. So you’re in good hands with GoHosting. Strong service partnerships in cPanel, Dell, TransACT and Tier 4 data centers allow them to offer solid solutions to mostly medium-sized companies and individuals in Australia. cPanel + WordPress or Plesk: Three shared web hosting plans with a choice of cPanel + WordPress or Plesk (more expensive) as your control panel. Plan 1 provides 1 GB storage, 4 GB bandwidth, and 1 add-on domain. Plan 2 provides 5 GB storage, 20 GB bandwidth, and 2 add-on domains. Plan 3 provides 30 GB storage, unlimited bandwidth, and 4 add-on domains. Office 365: More storage for small and medium-sized enterprises (SME) to collaborate. 50 GB mail storage, 1 TB OneDrive storage, Exchange ActiveSync, and Outlook Web Access. Higher plans also include Yammer and Skype for Business. Cloud Business Pack: An all-in-one hosting solution aimed at small businesses. 5 GB of storage, 20 GB data transfer, everything in the Office 365 Business Essentials plan, security, Rapid SSL certificate, and a (.au) domain. Managed cPanel Servers: Fully managed cPanel servers with dedicated resources. MCP1 provides 2 GB memory, 40 GB storage, and 400 GB bandwidth. MCP2 provides 4 GB memory, 60 GB storage, and 500 GB bandwidth. MCP3 provides 8 GB memory, 100 GB storage, and 1000 GB bandwidth. Virtual Servers: Truly virtualized server space with dedicated resources and enhanced firewall protection for businesses. GoVSpace1 provides 2 GB memory, 40 GB storage, and 400 GB bandwidth. GoVSpace2 provides 4 GB memory, 60 GB storage, and 500 GB bandwidth. GoVSpace3 provides 8 GB memory, 100 GB storage, and 1000 GB bandwidth. Dedicated Servers: Housed in one of two ASIO T4 Standard data centers with Tier 4 redundancy, and provisioned on a custom basis in response to a request for a quote. Each type of hosting comes with the software and resources you need to succeed. The shared web hosting solution comes with cPanel and Softaculous, MySQL, and a number of software frameworks such as Python and Ruby. The Office 365 hosting solution comes with software suitable for SMEs such as Yammer, Skype for Business, and Exchange ActiveSync. No plans come with a content management system (CMS) pre-installed, but the simple sign-up process gives you the freedom to set up a solution that is perfect for you. First, the bad news. No trial periods or refunds for hosting plans are offered unless GoHosting is unable to provide the promised service. Nor do they offer website migration. Now the good news. GoHosting does offer a three-day grace period during which you can refund your domain. 24/7 support is offered with all pricing plans via an Australian phone line or ticket support. They have a good reputation for responsive expert technical support plus a well-populated knowledgebase. Despite the decent range of products and prices, I would personally prefer a few more unlimited options and fewer restrictions on their cheaper plans. GoHosting offers almost all types of hosting via its premium hosting solutions. Their all-in-one Office 365 package is an especially good option for small to medium businesses with modest hosting requirements. Wondering how GoHosting stacks up against other Web Hosting companies? Enter any other Web Hosting company and we will give you a side-by-side comparison.